Going Clear (Dir. Alex Gibney, 2014) is screening at GFT until Thursday 2nd July. My accompanying programme note will be available at screenings – you can download the physical version here and there’s an online version at GFT’s blog here. GFT archives all its programme notes online here. Scientology today list 13 bases in the UK, including the Hubbard Academy of Personal Independence Scientology Edinburgh. Scientology ministers were authorised to perform wedding ceremonies by the Scottish registrar general in 2007. In 2013, the UK Supreme Court then ruled that a London Church of Scientology chapel was a “place of meeting for religious worship” and that henceforth could be used for marriages, creating uncertainty as to the future legal (particularly tax) status of Scientology in the UK. The 2011 census recorded 188 declared Scientologists in Scotland (just above 171 Satanists, below 245 Druids and by comparison to 11,746 Jedi Knights). In the spring of 1968, William Burroughs spent a week at the Scottish Scientology Centre in Edinburgh. World Gone Wild (dir Lee H Katzin, 1988), a post-apocalyptic B-movie, stars Adam Ant as Derek Abernathy, a murderous cult leader who preaches from a book entitled The Wit and Wisdom of Charles Manson. 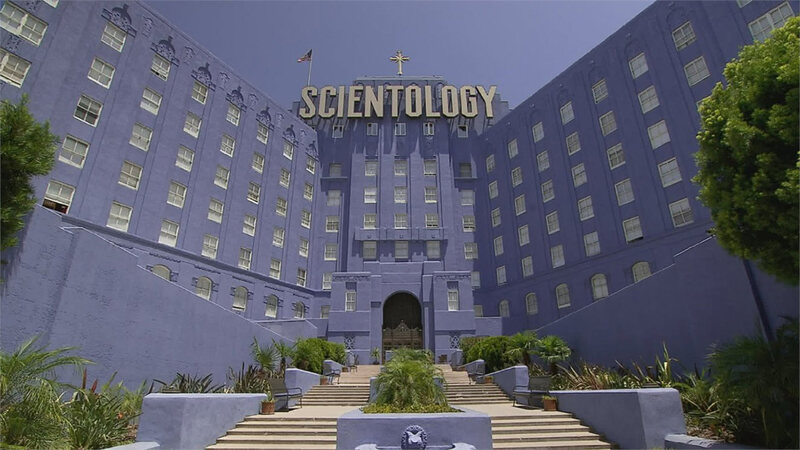 That book was retitled, in fact, after lawyers for Scientology got wind of the original choice – L Ron Hubbard’s Dianetics – and paid a visit to the producers (‘We have no idea how they heard about those scenes,’ a representative was quoted at the time). Louis Theroux is also planning his first theatrical documentary, Stairway To Heaven, about Scientology, whose lawyers promptly informed Theroux that the church, not coincidentally, was producing one on him. If you have any thoughts on Going Clear or my note, I’d love to hear them – post a comment here or on GFT’s blog (or you can even email me here). This entry was posted in GFT, Glasgow, Preview, Programme Note and tagged 2015, Cinema, Documentary, Film, GFT, Glasgow, Scientology, Scotland. Bookmark the permalink.